2019 features headlining act The Underachievers and is the first year the festival is held over multiple days. 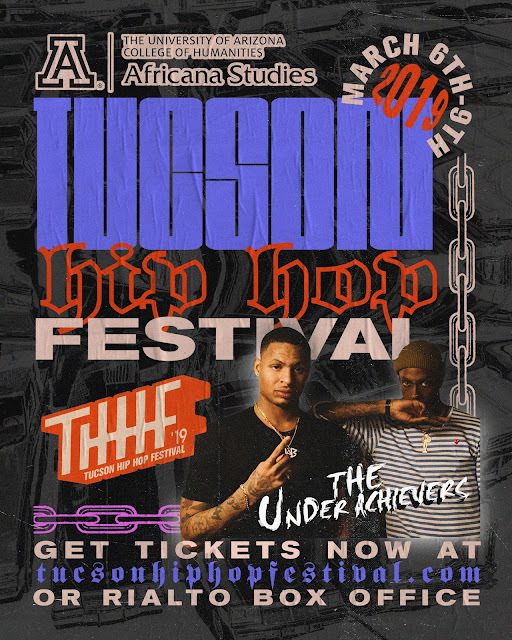 TUCSON, AZ: The Tucson Hip Hop Festival (THHF) returns for its third installation on March 9, 2019. The festival, held on the grounds around 191 Toole, celebrates all the elements of hip-hop, including rap, graffiti, bgirl/bboying and deejaying and will feature more than 100 local and regional artists across 9 stages. Brooklyn-based duo The Underachievers is set to headline fresh off the release of its “Deebo” single in anticipation of the Lords of Flatbush 3 project. This year marks the first time that THHF will be held over multiple days. Starting on March 6, there will be several events including panel discussions, community workshops, mentorship opportunities and a performance by Masta Ace and Marco Polo at Hotel Congress on March 8. THHF prides itself on giving local artists a platform to showcase their art and network with fellow artists as well as get insight from industry experts. The local community comes together to enjoy local food trucks and shop local vendors all in an organic, welcoming, all-ages environment. Past performers at THHF include Murs and Bun B while speakers include veteran rap journalist Soren Baker, writer and photographer Andres Tardio and marketing specialist Ashley Outrageous. Tickets for the 2019 Tucson Hip Hop Festival will be available for purchase online or at the Rialto Theater box office. Media inquiries can be sent to media@tucsonhiphopfestival.com. For more information, please visit tucsonhiphopfestival.com and follow on Instagram and Twitter.